Take your best guess as to why this episode is a day late - you probably know in your hearts why this is on Friday instead of Thursday. But don't dwell on it too long, because you've got a brand new episode to keep you company this weekend. 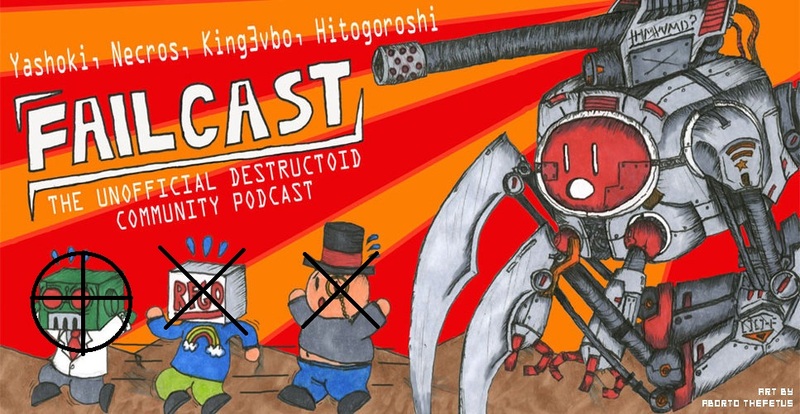 Community guest Ryu89 joins Yashoki, King3vbo, Hitogoroshi, and Necros to talk about the sad state of video game box art, the first time they completed a 360 game completely, answer questions about World of Warcraft, and generally find ways to waste time and completely mess up a potentially good podcast. So, as usual, lots of bitching, odd moments of brilliance, and plenty of the fail you've come to love. 23:15 - Apparently we got called out? 40:45 - Necros is in the Dtoid comic, rest of Failcast to follow? As always, email [email protected] to see about being on the show or contributing! Download this if you know what's good for ya!